Environmental success stories: On Earth Day, visit places saved by conservationists. To celebrate Earth Day, visit a spot that was almost flooded, polluted, or paved over. Today that passion has morphed into guilt. Our lifestyles are driving global climate change, and developing countries want to grow and consume like wealthy nations. Earth Day has become a day for penance—picking up trash, turning off lights—and debating whether the environmental movement has lost its way. Introspection is healthy within limits. And yes, saving the planet is more complicated now than it seemed 40 years ago. But analysis and what-ifs shouldn’t obscure a simple point: Without an environmental movement, the United States would be a lesser country. As Hemingway wrote in For Whom the Bell Tolls, “The world is a fine place and worth the fighting for.” Many people have lived out those words by saving beautiful spots that otherwise might be paved over, polluted, or flooded today. Here are seven examples to be thankful for, all open for visits year-round and prime destinations to enjoy on Earth Day. Storm King Mountain, New York. 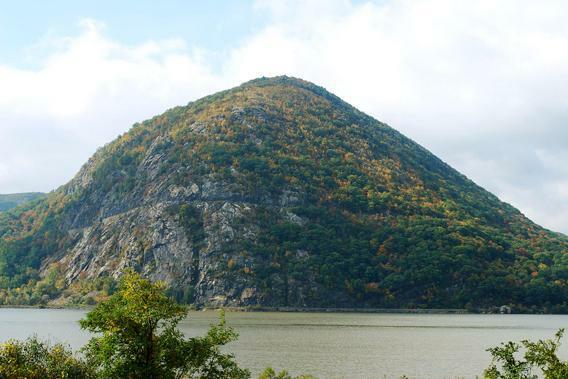 Consolidated Edison, the New York utility, wanted to embed a hydroelectric power facility into the face of this scenic peak on the Hudson River’s west bank in the early 1960s. Local citizens objected that a reservoir, pumping station, and power lines would mar Storm King and threaten local fisheries and water supplies. They formed the Scenic Hudson Preservation Conference to lobby against the project. They won a landmark court ruling establishing that conservation groups could claim standing to sue—even if they were not economically injured, a departure from legal precedents—and challenge projects that threatened attractive natural areas (Scenic Hudson Preservation Conference v. Federal Power Commission, 1965). Some of Scenic Hudson’s leaders went on to help found the Natural Resources Defense Council. Go there: New York/New Jersey Trail Conference. 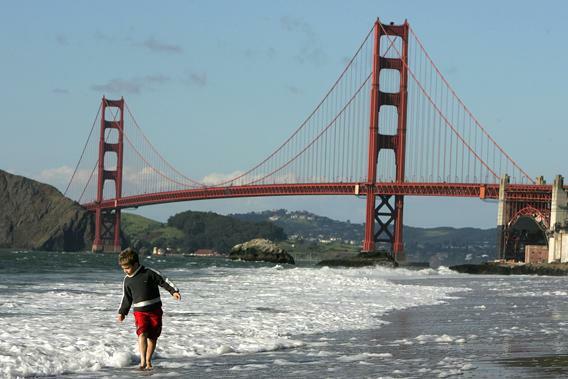 A boy plays in the water at Baker Beach near the Golden Gate Bridge. San Francisco Bay, California. Half a century ago, San Francisco Bay’s shoreline was rimmed with wharves, factories, refineries, ports, trash dumps, and sewage discharge outlets. Only four miles of coast were open to the public. Neighboring towns such as Berkeley and San Mateo were planning to fill in parts of the bay to expand their land areas. Then three East Bay women founded the Save San Francisco Bay Association, now known as Save the Bay. They mobilized neighbors against Berkeley’s infill plan, then linked thousands of other people around the area and successfully lobbied for a ban on similar projects. Save the Bay also pushed for the creation of the San Francisco Bay Conservation and Development Commission, which was established in 1965 to manage the shoreline. Today a cleaner bay is a magnet for birders, boaters, and windsurfers. Industrial salt ponds around its perimeter are being converted back into marshes, and harbor porpoises are returning for the first time in some 70 years. Earlier this year Sylvia McLaughlin, age 96, one of Save the Bay’s co-founders, received a Jefferson Award, a national citation for voluntarism and public service. Go there: San Francisco Bay Trail Project. Pelican Island is near Vero Beach, Fla.
Pelican Island, Florida. In March 1903, a group of naturalists visited President Theodore Roosevelt with an urgent request. They wanted him to protect Pelican Island, a 5-acre hummock near Vero Beach, Fla., at the mouth of the Indian River. Pelican Island was a nesting site for herons, egrets, spoonbills, and other tropical birds that were widely hunted at the time for their decorative feathers—prized ornaments on ladies’ hats. The island was about to be opened up for homesteading, which scientists feared would speed the slaughter. Roosevelt asked whether any law barred him from making the island a Federal Bird Reservation. 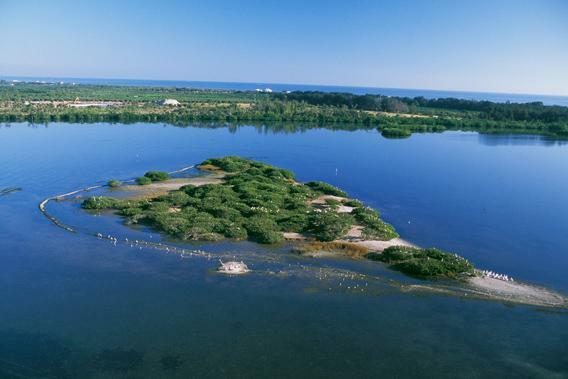 Told that there was no obstacle, he replied, “Very well then, I so declare it.” Pelican Island became the first unit of the National Wildlife Refuge System, which now protects more than 150 million acres of lands and waters nationwide. Roosevelt alone designated 50 more refuges during his presidency. Go there: Pelican Island National Wildlife Refuge. Lady Bird Johnson Wildflower Center, Texas. Lady Bird Johnson’s name will always be linked with the idea of “beautification,” her own shorthand for her conservation proposals. But that term trivializes her serious concerns about the ugliness she saw spreading across American landscapes. As first lady, Johnson supported measures to remove junkyards and billboards from U.S. highways and to clean up trash and plant gardens across Washington, D.C. After Lyndon Johnson left office in 1969, she took those causes back to Texas, where she co-founded the Wildflower Center in 1982 with actress Helen Hayes to protect and preserve native plants. “How do we save these species in the face of an ever-expanding human population and its impact on the land?” she wrote in an open letter to visitors. “Some of the answers lie as close as our own backyards, and as far as the highways that transverse this nation to its outermost reaches.” Today the center operates a seed bank, helps communities control invasive plants, and adapts concepts like native lawns and green roofs for Southwest conditions. Its trails and gardens are landscaped with poppies, bluebonnets, and other native Texas plants. 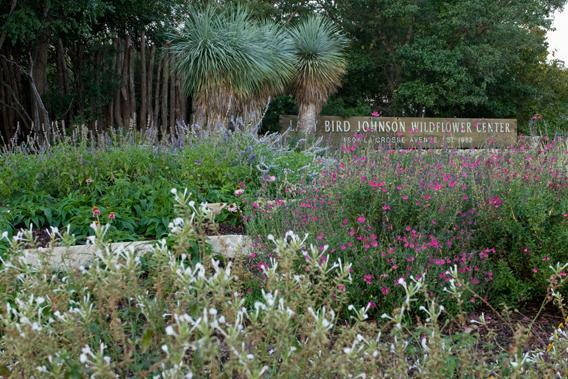 Go there: Lady Bird Johnson Wildflower Center. The Yampa River flows through Dinosaur National Park. Dinosaur National Monument, Utah and Colorado. In the early 1950s, the Bureau of Reclamation, a federal agency that builds and manages water projects, announced plans to build a dam at Echo Park on the border of Colorado and Utah, flooding the spectacular Green and Yampa river canyons. The site was in the middle of Dinosaur National Monument, which had received federal protection in 1915 after paleontologists discovered thousands of fossils there. The Sierra Club, the Wilderness Society, and other conservation groups formed a coalition to block the dam. To increase awareness, they led river trips through the canyons and published photographs, films, and a book about the park. Testifying before Congress, Sierra Club Executive Director David Brower pointed out mistakes in technical calculations published by the Bureau of Reclamation to justify the dam. The groups also made a strategic decision not to oppose a higher dam at Glen Canyon on the Colorado River in Arizona, which Brower later called his worst mistake. 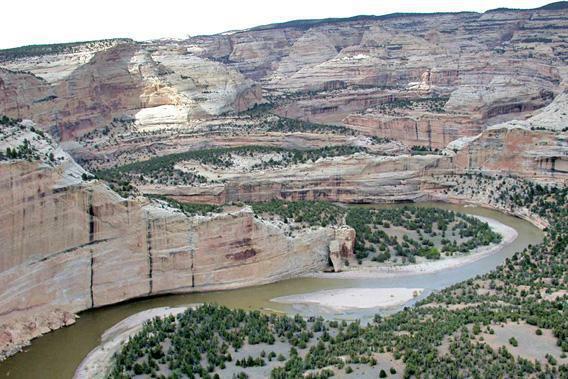 But the campaign to save Dinosaur National Monument was a preview of what a united environmental movement could accomplish—even against powerful government enemies. Congress canceled the Echo Park Dam in 1956, and Dinosaur National Monument remains a hot spot for white-water rafting. Go there: Dinosaur National Monument. Horicon Marsh is the largest freshwater cattail marsh in the U.S.
Horicon Marsh, Wisconsin. Glaciers carved Horicon Marsh out of prairie soil in southeastern Wisconsin 12,000 years ago. Horicon was a Native American hunting ground until European settlers arrived in the 1840s. A dismal century followed: The marsh was dammed for water power, then undammed, then opened for large-scale duck hunting, then drained for farming. In the 1920s and early ’30s, its exposed peat soils dried out and repeatedly caught fire, leaving it a literal smoldering ruin. Enter the Izaak Walton League, which lobbied the Wisconsin legislature to restore the marsh. In 1934 the fires were doused and water started flowing once again. As marsh plants grew back, waterfowl followed. 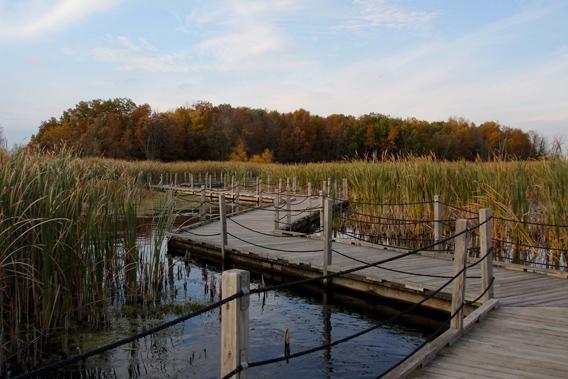 Today Horicon Marsh covers 50 square miles and is the largest freshwater cattail marsh in the United States. Two-thirds of it is a National Wildlife Refuge, and the rest is a state wildlife area. A vital stop on bird migration routes, it has been named a Wetland of International Importance under the Ramsar Convention (an international environmental treaty) and a Globally Important Bird Area by the American Bird Conservancy. More than 300 species of birds have been sighted there, drawing birders year-round. Go there: Horicon Marsh Wildlife Area. Park rangers dressed in period costumes guide the Georgetown up the C&O Canal using mules for power. C&O Canal, Maryland. The Chesapeake & Ohio Canal runs next to the Potomac River for 184.5 miles, from the mountains of western Maryland to Georgetown in Washington, D.C. Mules plodded along its sandy towpath from 1850 to 1924, pulling barges full of people and goods back and forth over 11 stone aqueducts and through 74 lift locks. After World War II, Congress proposed paving the canal over and converting it into a scenic highway through the Potomac River valley. But Supreme Court Justice William O. Douglas, who hiked 15 or 20 miles along the canal every weekend, was outraged, especially when the Washington Post endorsed the idea. The canal, Douglas wrote to the Post, was “a refuge, a place of retreat, a long stretch of quiet and peace at the Capitol’s back door … not yet marred by the roar of wheels and the sound of horns.” At Douglas’s invitation, the Post’s editors joined him and a crowd of conservationists to hike the length of the canal. The 55-year-old justice set a brisk pace, and only eight of the other 57 people in the original hiking party went the full distance with him. But the walk generated a wave of publicity and support for protecting the canal, which became part of the National Park System in 1971. 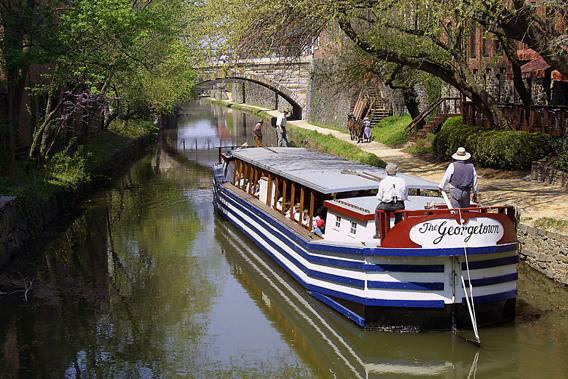 Go there: Chesapeake & Ohio Canal National Historical Park. If you like to see history in the making, other rescues are happening now. Crews are removing obsolete dams from rivers like the Penobscot in Maine and the Elwha in Washington state, letting pent-up waters flow freely again and reviving seasonal fish spawning runs. And rail-to-trail projects are converting thousands of miles of abandoned railroad tracks into public walking and cycling paths across the nation. (New York City’s High Line, an elevated walkway on an old rail bed, is one of the top tourist draws in the United States.) Here’s a rebellious idea for Earth Day: Forget about carbon footprints for a few hours and take a hike.